For a wine lover, there are few experiences more rewarding than a wine holiday in France. It doesn’t matter whether you are drawn to the rustic charm of the country’s southern fields, the lifestyle in Provence, the bright lights of Paris, the winding river Loire or the wonder of the Rhone Valley – no trip will leave you unmoved. For me it was Bordeaux. A world of castles and vineyard sites dating back to Roman times. 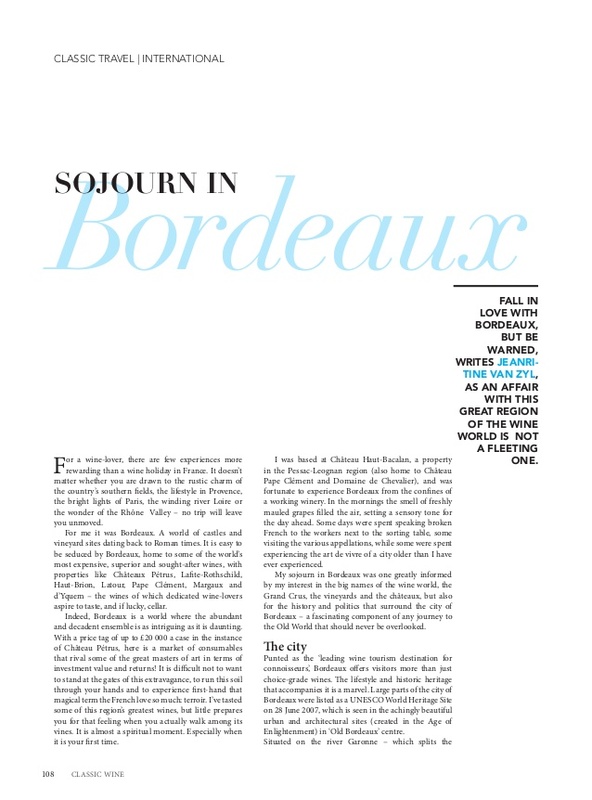 It is easy to be seduced by Bordeaux, with it being home to some of the world’s most expensive, superior and sought-after wines – what with properties like Chateaux Pétrus, Lafite-Rothschild, Haut-Brion, Latour, Pape Clement, Margaux and d’Yquem – the wines of which dedicated wine lovers aspire to taste, and if lucky, cellar. Indeed, Bordeaux is a world where the abundant and decadent ensemble is as intriguing as it is daunting. With a price tag of up to £20 000 a case in the instance of Château Pétrus, here is a market of consumables that rival some of the great masters of art in terms of investment value and returns! It is difficult not to want to stand at the gates of this extravagance, to run this soil through your hands and to experience first-hand that magical term the French love so much: terroir. I’ve tasted some of this region’s greatest wines, but little prepares you for that feeling when you actually walk among its vines. It is a holy moment. Especially when it is your first time.